Rated 169, Buveur D'Air went off as the 1/6 favourite in last year's Fighting Fifth Hurdle, and duly obliged without breaking a sweat; as you'd expect at that price. The 2018 Champion Hurdle winner is back on the same route today (2.05 Newcastle), and is once again rated 169, but there's a big difference in price this time around, with 11/10 available about Nicky Henderson's seven-year-old. The reason for that price difference, of course, is the presence of Samcro. The assessors don't always get it right but at 160, Samcro is a good deal closer in the ratings compared to last year's nearest rival Irving, which was rated 154. It should be a cracking race - although it's hard to find excuses for Samcro's 4/9 defeat at the hands of Bedrock at Down Royal recently, and I feel the market has got today's contest correct, with Samcro priced 2/1. Samcro's Champion Hurdle prospects have taken a dent for sure, and many believe he's really a star chaser in the making although a lot can happen between now and March which could push his ante-post price of 4/1 in either direction. For the moment, Gordon Elliott is keeping him over the smaller obstacles and confirmed that he won't be going chasing this season. Buveur D'Air remains the Champion Hurdle favourite around 9/4, although we should know a bit more after today provided they all run to form and we have no fallers. Shaking off the cobwebs will have done Samcro some good, and, at 14/1, Bedrock is not expected to catch him out again today, but both horses will have some job holding off the favourite, provided he's fit and well after his 263-day absence. I'm a huge fan of Samcro and I backed him with a large stake when he won the Ballymore Novices' Hurdle at Cheltenham, albeit at the short price of 8/11, but he's since fallen at Punchestown which was unfortunate. He then proved the old adage that there's no such thing as a dead cert in this game when last seen at Down Royal. He's definitely a star, but is still somewhat unpolished. If there's one word that describes Buveur D'Air, it's 'consistent'. He's now won ten races in a row including two chases back in 2016, and he's proven on all sorts of ground. Unlike some of his easier races, he didn't have it all his own way in the Champion Hurdle and had to roll up the sleeves after the last - but it was good to see him tested, and he's already achieved a hell of a lot for a seven-year-old. 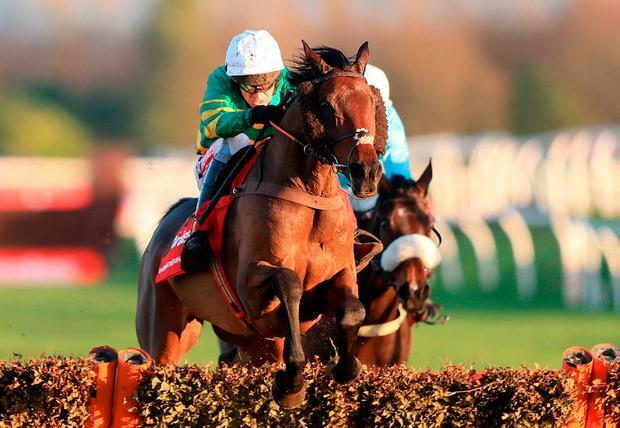 This is like a mini Champion Hurdle and it's going to be a real test for Buveur D'Air, but all the evidence suggests he's well capable of facing up to this latest challenge. Of the rest, Summerville Boy deserves a mention. Tom George's Supreme Novices' Hurdle winner is prone to a few mistakes so may find life difficult until he gains more experience, but he deserves to take a chance here against some top talent, and it will give a good indication of where exactly he's at right now. For excitement, the all-weather pales in comparison to a fantastic Grade One but it can pay the bills sometimes when you find the right horse, and I reckon Secret Ace is a very fair price around 3/1 for the opening Ladbrokes Home of the Odds Boost Novice Stakes at Wolverhampton (5.15). Fair enough, we don't have a whole lot of form to go on in this race but the filly shaped really well when fifth in her debut race at Kempton earlier on this month. Sent off with an SP of 6/1, she travelled really strongly and hit 8/11 in-running on Betfair before weakening, but it's a good base to build on, and a drop in trip should help her cause this evening. The main challenge is likely to come from Lorna Cole, which is available at 9/4 at the time of writing. Trained by William Muir, she dug deep to win her first and only race at Lingfield. She didn't look at all green which is a big plus, although today's race looks quite open and she has a penalty so at the prices, I reckon she's best avoided. Robert Cowell's Society Star is another one for the shortlist. She's raced twice, and came on from her debut fourth when finishing third last time out here to the odds-on favourite Leodis Dream. Manchester United finally scored a Champions League home goal against Young Boys on Tuesday, but they were poor overall. In the League, they were pretty bad when only getting a draw to Palace at Old Trafford last week so I’m somewhat cautious about backing the Red Devils right now – but the 10/11 for United to win away to Southampton is just too good a deal to miss. Mourinho can relieve the pressure temporarily against a Saints side which are 11/4 for relegation. The Listed five-runner Ladbrokes Mares’ Novices’ Hurdle (12.10 Newbury) would appear to be between Lust For Glory and Posh Trish, and priced around 11/8 and 5/2 respectively, I’m happy to side with the latter. Paul Nicholls’ mare was a decent sort in bumpers, and having won on her hurdling debut at Chepstow, she finished second to Lust For Glory here last month. But the selection is on better terms at the weights this time around. Kemboy's owners said they were “gutted” that he won't make it to the Ladbrokes Trophy Chase (3.0 Newbury) following a cancelled ferry from Rosslare, and his spot at the top of the betting may go to Elegant Escape. There was a lot to like about that gelding's recent success at Sandown on heavy ground and he's sure to go close, but with a 4lb penalty and a short price of 4/1, I'm looking elsewhere for value. One horse punters may be overlooking around 20/1 is Nigel Twiston Davies' Flying Angel, which is due to go up 4lbs to 146 following his second place in a decent handicap at Ascot last week. Racing off 142 today, he's a couple of pounds well-in at these weights.